On June 22 7 scouts, another adult adviser, and I departed Champaign for Cimmaron, New Mexico and Philmont Scout Ranch as crew 724-K. August 6 we returned to Champaign. In between, we drove 2,382 miles, we backpacked 62 miles (itinerary 6), and hiked another 10-20 miles. From a base camp at 6500′ we hiked to the peak of Mt. Phillips at 11,700′, with lots of elevation changes in between. We only had one stay of two consecutive nights in the same location, the rest of the time we traveled; most days on foot. So what did get see as a result? As you would expect on a backpacking trek, we got up close and personal with lots of nature. The mountains of Northeast New Mexico are gorgeous. At base camp, they referred a number of times to the back country of Philmont as “God’s Country”, and it is! We transitioned from the high plains desert to the lush forests of the mountains, and along the way experienced meadow walks, hikes along babbling brooks, and the views from mountain peaks. We saw Ponderosa Pine, Douglas Fir, White Fir, and Quaking Aspen. We saw woolly mullen, mexican hat, hookers evening primrose, yarrow, scarlet bearded tongue, purple aster, fleabane, and elk thistle. We saw mule deer, chipmunks, squirrels, rabbits, lizards, grouse, turkey, falcons, hawks, eagles, ravens, hummingbirds, and even a bear. We saw the Ursula Major, Cassiopeia, the Milky Way, and indeed so many stars it was hard to pick out other constellations. And rocks — primarily Ignius Intrusion Daysite Porefree, as it was explained to us. Unlike most role -your-own backpacking adventures, our particular itinerary into the Philmont backwoods had us staying at, or at least passing through, staffed camps almost daily. A handful of these staffed camps were actually living history museums. Abreu was a 19th century small homestead with a canteen. While there, we milked goats, ate our breakfast complete with root beer from the canteen, and made adobe bricks. Fish Camp was an early 20th century fishing lodge for the former owner of the land, Wade Phillips. While there, we learned fly casting and fly tying, while also touring the original cabin. Crooked Creek was a small homestead from the 19th century. During our brief stay there we made candles, got water from a spring, and played with the cows and chickens. Clear Creek was an 18th century trapping outpost. There we shot black powder rifles, cut wood with a cross cut before splitting it, threw tomahawks, and toured a trappers cabin. Cypher’s Mine had been a working mine back in the day. While there we attended a “stomp” telling the story of the mining days in song and through jokes. We also worked in a black smith’s shop to make an ‘S’ hook and toured the old “Contention” mine. Clark’s Fork was an old horse ranch, where we enjoyed a chuckwagon dinner, and also had various items of clothing branded with various Philmont brands (oh, and we played horse shoes, too). Other staffed camps, while not truly a living history museum, still had many fun adventures. Zastrow had hula hoops made of steel (I set the new adviser endurance record, going 30 minutes straight with it), horse shoes (a new favorite pastime for a number of the scouts), and an Indiana Jones-themed orienteering course. Carson Meadows had search and rescue in addition to horse shoes. Cimmaroncito specialized in rock climbing and also had a most interesting (for me, at least) nature walk. I went into this adventure with some significant reservations, mostly related to cost. We had gone on other backpacking adventures as a Boy Scout troop before. The most expensive previously had been our 10 day trek to Isle Royale, MI, and it was 1/4 the cost. This time around we handed off much of the logistics for the trek, including meal planning, route planning, and a good deal of the advanced safety planning to professionals. Might the troop have been better off once more planning our own trek, and by lowering the cost (and minimum age requirement) allow more of our scouts to go? Philmont has a mystique about it that I didn’t comprehend until having been through it. It starts with the length of the trek itself. While most people can stick together for short durations no matter their feelings for each other, doing so for 16 days requires some compromising and bonding that can’t easily be avoided. The challenges and joys of nature, physical and mental, really come home when on a tough trail for 11 days straight, too. I happened to pull open the verses in Romans 5 that talk about how struggles lead to perseverance, perseverance leads to character, and character leads to hope. Those were timely words the night before we summited Mt. Phillips, and became a mantra describing as well as encouraging us through the experience. The programs at staffed camps were a motivator, something to look forward to after a day on the trail, as well as an educational opportunity. 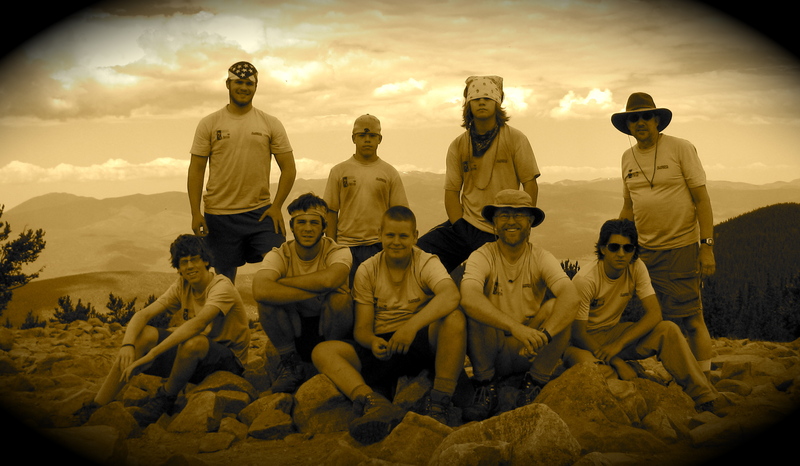 But while each of these contribute in their own right to the Philmont Experience, it was more than just those. There was a gestalt that is hard even now to describe. It was fostered through a number of little things: emphasizing boy leadership in the crew leader and chaplain’s aide; providing and encouraging the use of a daily devotional book; and through the tradition of thorns and roses, in which we share our most and least favorite activities of the past day, as well as those things we most and least looking forward to in the coming day. Added to that are the almost continuous “teachable moments” through individual and group reflections that arise during the events of the day, from breaking camp at 6AM to hiking a tough part of the trail to the struggles of a 15 year-old crew leader attempting to lead a group of 14-18 year old scouts on too little sleep. The Philmont tradition has managed to mix the entirety of these items together to create a rich environment that enriches mind, body, and soul for every participant, if only the individual opens themselves up to the moment. From what I saw in the changes in us all, I am confident each of us from Crew 314 did.